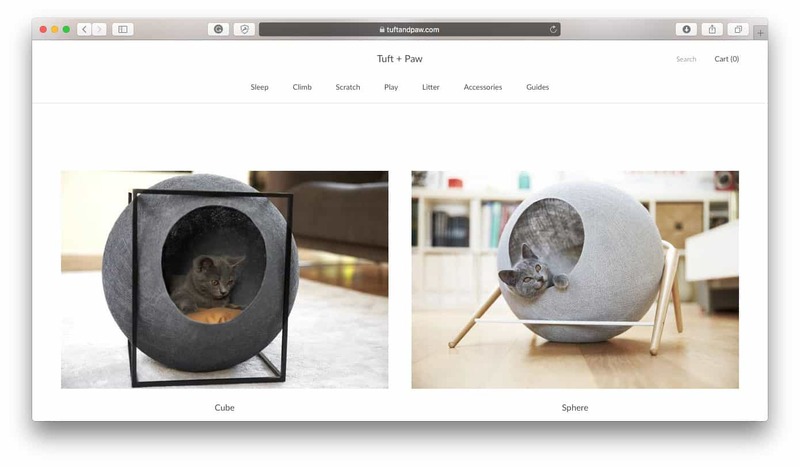 In this ecommerce business case study, learn about Tuft + Paw, a modern cat furniture company that focuses on creating high-quality products that both humans and cats love. 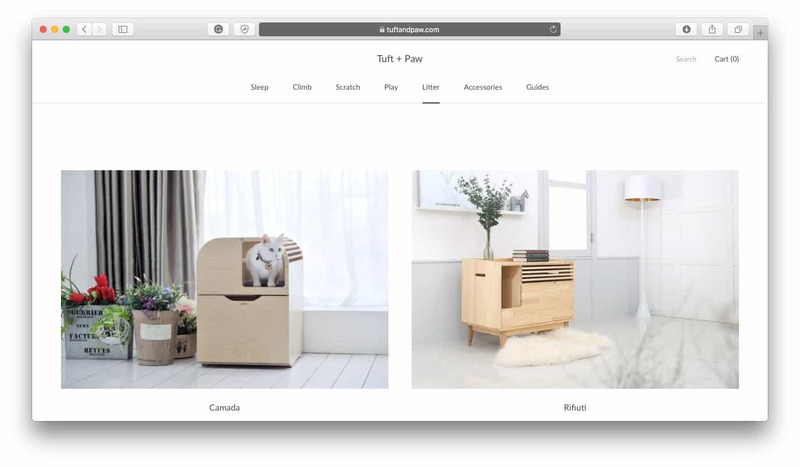 Tuft + Paw was born out of the founders’ frustration for beautiful and functional cat furniture that not only their cat would love but they would, too. 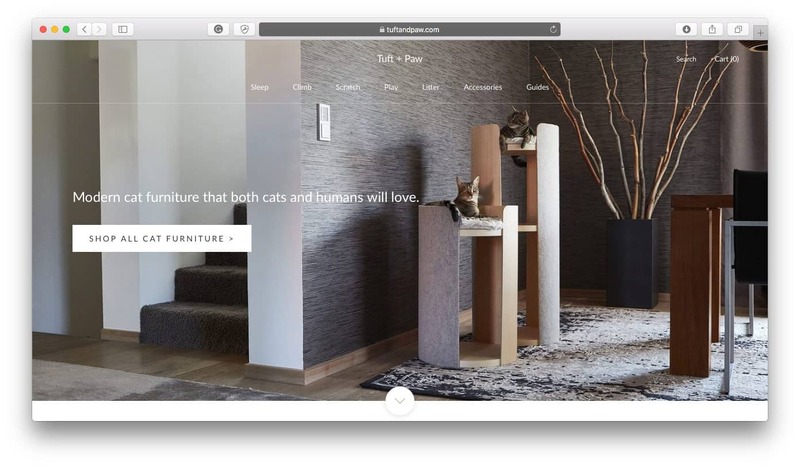 Their innovative designs and modern style have informally earned them the title as “the West Elm of cat furniture,” which speaks to the quality of their designs and materials. Not only does Tuft + Paw focus on creating a more comfortable environment for house cats but they also dedicate resources to help strays in shelters have a more comfortable life, too. Supporting animal welfare initiatives and offering a donate-a-bed program, they’re a business with a conscious. 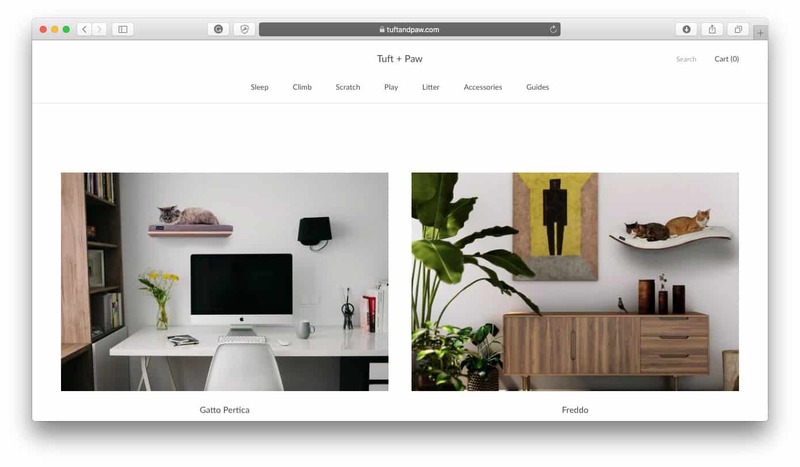 Read on to learn more about Tuft + Paw and how they’ve successfully developed an ecommerce business by solving their own pain point and developing their passion for their niche. Why did you start this business? Where did you get the idea for this business? In 2015, my girlfriend and I went on a trip to South America and we saw so many homeless cats. 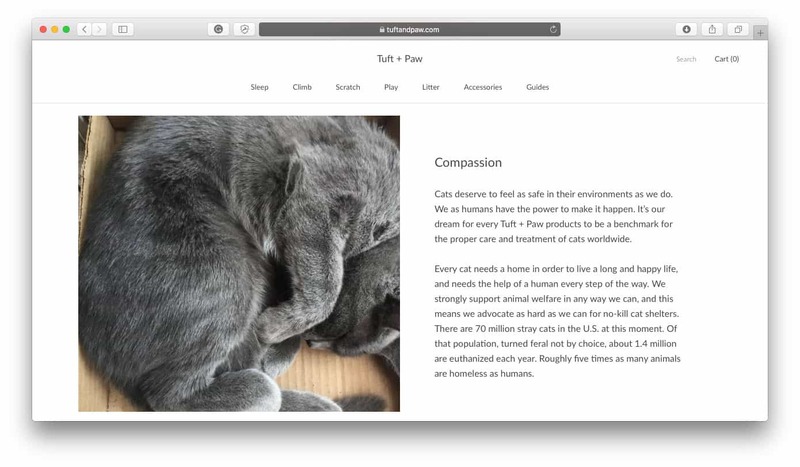 In the back of our minds, we thought it would be nice to build a business that could help the homeless cat population given that over 1 million cats are euthanized each year in the US alone. Fast forward a few months and we adopted our cat Samuel J. Peppers and couldn’t find any cat furniture that wasn’t super tacky. It felt like the perfect opportunity. What has your process been to design and create your products? How did you come up with the initial design, have you refined it over time and do you work with a product designer to create your products? It’s really tempting to just make a “nicer version of X” but what we’re trying to do is rethink cat furniture. For example, while designing our newest scratching post (to be released in 2019), our team was asking questions like “What makes cats happy?” and “Why do cats scratch?”. Why are all scratching posts shaped like a post, why not a pyramid? We’re trying to start from the basics. Our team consists of a cat behaviorist, a product engineer, and a product designer. We don’t make any assumptions until we test for ourselves. We start by making sketches of potential designs, then we pick our favorite and build a prototype to see if cats will even use it. Once we confirm cats love it, we make a polished prototype and proceed to manufacturing. Designs can change slightly over the years if we notice somewhere we can improve based on customer feedback. How do you source the materials to create your products? Have you experienced any challenges sourcing the materials for your products? Our designer and engineer suggest ideal materials, then we sleuth around on Google and Alibaba until we have a list of potential suppliers. We get samples from each supplier to compare quality. It’s not difficult but it’s really time-consuming. How do you make your products – do you work with a manufacturer or supplier, and if so, how did you find your manufacturer/supplier? Did you experience any challenges when finding your manufacturer/supplier? Both, it just depends on the product. You can find someone who makes a similar product and then ask them to make a modified version to suit your needs. Finding a good manufacturer is very tough and a good relationship will take years to build. Most manufacturers get approached by so many foreigners so you need to show that you’re legitimate and will be placing large orders. The biggest challenge is that it’s hard to get anything done in a short time frame. We always ask a manufacturer to provide a sample to our specs, then we wait months to receive it, and when we receive it there are almost always some issues. So we ask for another sample and it takes another few months. It’s a classic example of “hurry up and wait” so it’s pretty much impossible to develop a new product in under a year. Your market is well saturated with other brand name businesses, how do you make your products stand out in the market? How do you differentiate yourself from your competitors? We don’t compromise on product quality in any way. This means that many of our items are expensive, but our customers know that our products are the best. I can genuinely tell any of my friends that Tuft and Paw has the best cat furniture. This gives us more flexibility with our product offering because when we can charge more we can focus on quality. When you first launched your products, did you have an audience to sell to right away or did you build your audience as you went? How have you continued to build your customer base over the years you’ve been in business? We just build our audience as we went. 2016 and early 2017 we were hardly doing any business and it really only started growing at the end of 2017. I’m a pretty firm believer in planting seeds, i.e. strategies that will benefit as time passes versus focusing on ad revenue in early stages. So a lot of the stuff we were doing like content marketing, Instagram, or building our email list didn’t really yield any results in the early days but is really paying off now. What challenges have you faced shipping your products? Are there certain methods you use or practices you have to be cognizant of? What tools/apps/products do you use to help streamline your shipping strategy? Store your product on the East & West coast of USA so it’s cheaper to ship to the customer AND cheaper to ship items from Europe (to the East Coast) and Asia (to the West Coast). For example, shipping a container of goods from Japan to Seattle can be half the price as shipping to NYC because the container needs to go around the entire continent. Figure out how to flat pack your products: This is a huge part of our design. Oversize items get an extra fee of $75+ from most carriers and “oversize” isn’t even that big. What’s the best tool you use to stay organized with your business? Are there any particular apps, tools or services that make running your business easier or more efficient? I couldn’t operate my business or personal life without Trello. I use it for absolutely everything. I use Boomerang for Gmail so that I can reschedule any emails for a later date when I actually need to deal with them. Batched Inbox so that I only get emails delivered once per day at 7am so that I can complete other tasks throughout the day. And finally, Upwork – we outsource a ton of tasks and it allows us to keep our team small and nimble. Which ecommerce platform do you sell on and why? Shopify, it does everything we want at a great price. The app and developer ecosystem is very rich so we’ve never had any issues getting anything done. It’s also super easy to get started and create a beautiful site. Which marketing channels do you find the most lucrative (your own social media, working with influencers, email marketing, referral marketing, paid advertising, etc.)? Do you have any core tools or resources you’ve used to grow your business that you wholeheartedly recommend or any particular marketing strategies you’ve employed to grow your business? I think PR outreach is probably the most underrated because it has such a ripple effect. One publisher might write about you, and then other publishers see that article and approach you etc. So just creating a list of media outlets that might be interested in featuring you (i.e. for us, it would be design or cat blogs). Then use something like Yesware to reach out to those people with a good, simple pitch. You need to make sure you have something worth talking about though, or an interesting angle at least. It’s basically just figuring out, “Who are your customers and where are they?”. For us, another technique was partnering with cat shelters around the US by providing them a referral kickback code. How did you make your first 10 sales? Your first 100 sales? Our first 10 sales were from Facebook Ads because we wanted to validate the idea that people would pay for quality cat furniture. Our first 100 sales were referrals from cat shelters and word of mouth. We constantly have delays due to being out of stock and underestimating how much time it will take to get inventory and we always feel so bad when we have to let a customer know they won’t have their order for weeks or even months sometimes. We’re launching a new product in early 2019 on Kickstarter that’s going to be a game changer. Just completing this product was a tremendous success for us because there were so many challenges along the way and I’m super proud of our team. I notice a lot of new ecommerce entrepreneurs trying to take shortcuts on the product because they’re so excited to get started “marketing”. So they decide to sell some widget off AliExpress so they can use their marketing chops to out-market the competition. But I think that your job as a marketer becomes 10x easier if you can offer a unique, quality product. I notice a lot of new ecommerce entrepreneurs trying to take shortcuts on the product because they’re so excited to get started “marketing”… But I think that your job as a marketer becomes 10x easier if you can offer a unique, quality product. So I’d recommend that new entrepreneurs spend a lot more time doing research on their product offering (i.e. instead of selling cheap accessible kimonos off AliExpress, maybe they could sleuth the internet and Reddit threads to find high-quality kimonos from a small Japanese artisan). Ideally, you could be a bad marketer and your products would still sell. Just get started. Smart people tend to overthink things and want to research and get everything perfect but you will just learn so much more by doing it. Our #1 goal is to have a successful Kickstarter launch for our top secret new product. What is the one thing you attribute the majority of your success to? This could be a strategy, a tactic, something that happened unexpectedly. What was the one thing that made the biggest impact for your business? I think just having the luxury of time, and being able to focus on marketing strategies that would pay off in the long run. We just focused on offering the best products and not putting any effort into tactics that would only help short-term success. It started off as a side project for me so I never felt the pressure to hit certain numbers by a certain date and my goal was always for it to be a success in the long run.